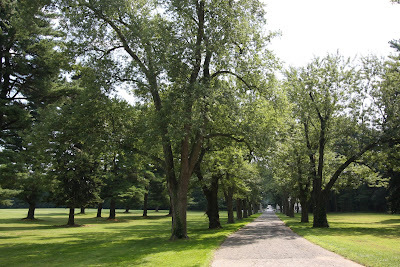 Looking down the front allee towards the main gate at Henry Carnegie Phipps' 'Spring Hill' estate in Old Westbury. After development is finished at the site (which is currently underway) there will be a four acre pond to the left of the above allee. The stables are in working order and belong to someone. The wall is set to be restored at some point. Property taxes ruined properties like these and the lives of the staff who maintained them. Is a pond being created while the rest falls into ruin?